Today kicks off the 40th anniversary of Walt Disney World. In celebration of this monumental anniversary the Disney pastry chefs have created something extra special for those guests visiting the park today, cupcakes. It's a chocolate or vanilla cake with chocolate ganache topped with buttercream icing and a fondant wafer with pictures of Walt Disney World. Available today only at the Main Street Bakery in Magic Kingdom! 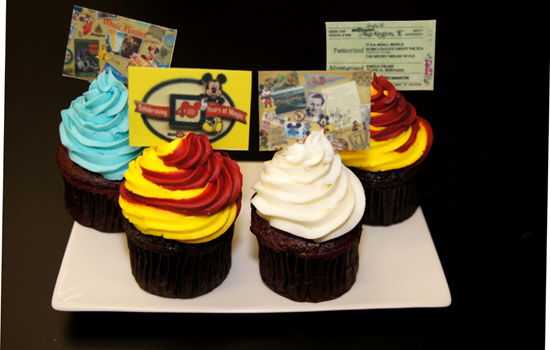 For those of you at the park today, pick one of these up and share your thoughts in the comment section below of these celebratory cupcakes.